What makes a standout Olympics memory? An elite talent at the top of their game, refusing to back down. A historic first. A triumph over adversity. It’s an uncommon blend of elements, which makes those occasions when they converge all the more gripping. Such was the case in early 2014, when America was collectively captivated by one of the greatest Olympics narratives of our time: Bob Costas’s bout with pink eye during the Sochi Games. We all remember the story: Costas had pink eye in one eye, and then he had pink eye in two eyes. He maintained his on-air post much longer than anyone would have expected under such conditions, stepping down only when it was physically impossible for him to continue. 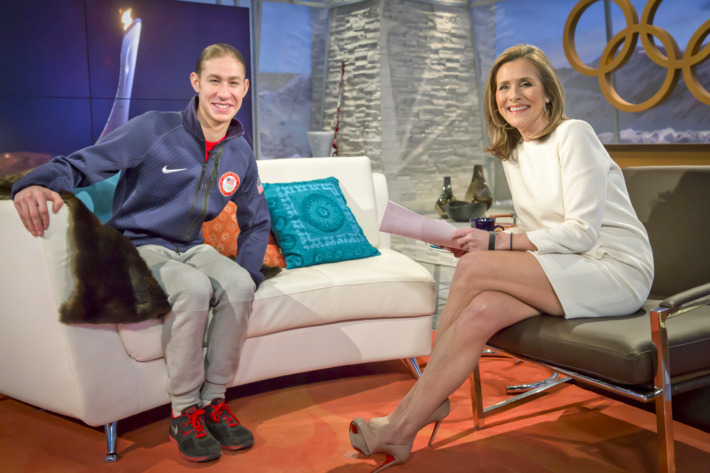 Taking his place was Meredith Vieira, who in so doing became the first woman to ever host prime-time Olympics coverage solo. Then, after the worst of his illness subsided, Costas returned to finish his job, even though he still sort of had a little bit of pink eye. It is genuinely something to be remembered and celebrated. 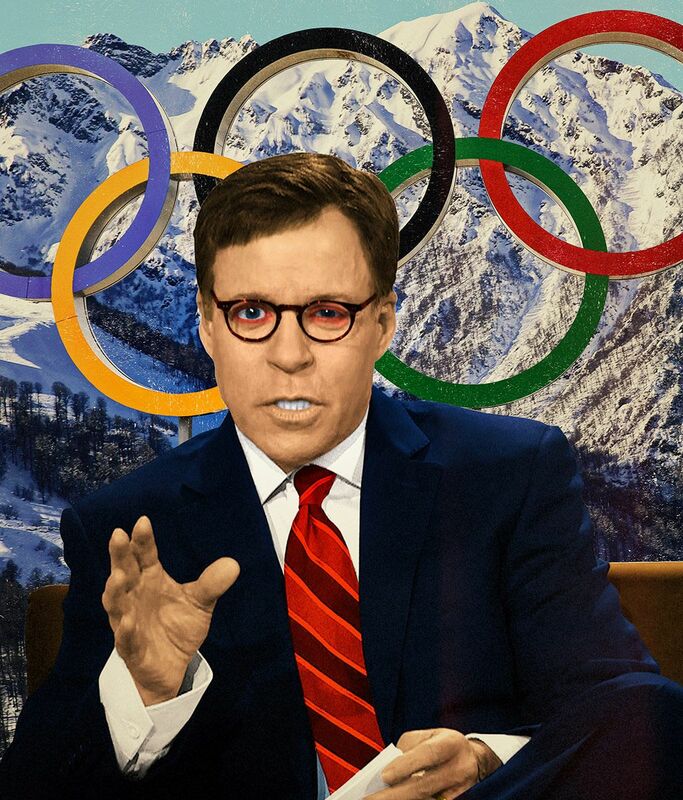 And so, this is the story of the time Bob Costas had pink eye at the 2014 Games, as told by NBC Olympics coverage executive producer Jim Bell, Meredith Vieira, and Bob Costas. Two days before the February 7 Opening Ceremony of the 2014 Sochi Winter Olympics, the NBC production team gathered for a meeting. Jim Bell: I was at a production meeting for the Opening Ceremony, and we had a pretty big group gathered to go over the show — this is a day or two before the Opening Ceremony. When Bob came into that meeting, it was noticeable that there was something wrong with his eye. I think the initial hope was that he was jet-lagged and tired, and it was just from the trip or his preparation — like he was reading into the wee hours of the night, preparing his notes. But it was clear then that there was something wrong. Bob Costas: I’d been in Sochi for a few days, and I woke up the morning of the first telecast, and I walk into the bathroom — you know, you splash a little water on your face, you shave, you shower and get ready — and I look and, I think it was the left eye first, it was swollen and red and looked like a slit. And I’m thinking — what in the world is this? Because I felt perfectly fine when I went to bed the night before. And there was no pain — it wasn’t like I woke up and felt like something was wrong; it wasn’t until I looked in the mirror. So I thought, well, I’ll go see the NBC doctors and see what they can do about it. And their first guess was that it was some kind of bacterial infection and, if that was the case, that it could be cleared up in a few days with antibiotics. So I wore glasses in order to partially disguise it. Bell: We had a show before the Opening Ceremony, and I think we probably fooled ourselves a little bit thinking, oh, we can get through this. But then he did a thing with the Today show, some sort of promotion, and next thing you know “Bob Costas’s left eye” was trending on Twitter. On February 6, a pink-eyed and bespectacled Costas did an Olympics preview during the Today show at 7 a.m. ET. By 11 a.m., articles about his eye had already been posted on Deadspin and BuzzFeed, and the image of Costas wearing his glasses was circulating on social media. A parody Twitter account called Bob Costas’ Left Eye (handle @CostasLeftEye) was launched at 8:10 p.m. that night. Costas: First night on the air, since it did have to be acknowledged, I said something about it, sort of half-humorously, and said what I thought to be true at the time — that the NBC doctors assure me that it will all be resolved in a few days. And then I think I said something like, “if only all my issues could be resolved that quickly.” That’s kind of how I handled it throughout. I didn’t try to make it a big deal or make it a story, but I imagine it was noticeable enough that it would have been a story even if it was 1968, you know. But now with social media it became a really big deal. After, like, two days, it spread to my right eye, and then they realized that it was a viral infection. At that point they knew that antibiotics wouldn’t clear it up. All you can do is kind of make the symptoms more comfortable while you let it run its course. It wasn’t possible to cover it up with makeup; I wore the glasses because they did disguise it a little bit, but they had two extremely capable NBC doctors there, and they flew a specialist in from California to look at me. His diagnosis was the same as that of the NBC doctors: that it’s just a viral infection and there’s nothing you can do except maybe eye drops and compresses and things like that, staying out of bright light. Bell: Conjunctivitis is so highly contagious, and obviously for someone who makes a living on camera, it’s not ideal — it’s not ideal for anybody, frankly. But it’s itchy, it’s irritating, it’s contagious, so, that was the fear. But if memory serves, I don’t think anybody else came down with it. By February 10, Costas’s pink eye had spread to both eyes. Now a national saga, the news was covered in Time, the Daily Mail, The Atlantic, ABC News, Deadspin, the New York Daily News, and Daily Intelligencer, among many others. It was also, of course, covered widely on social media. Costas: The thing about it was that almost all of us have gone to work feeling lousy. If I’d just had a stomachache, or even if I had a broken leg and it’s in a cast under the desk, nobody would have to know. You just grit your teeth and carry on. I’ve gone on the air feeling much worse than I felt at Sochi — it looked worse than it felt. But what was uncomfortable, especially after the first couple of days, was that I couldn’t stay on continuously without my eyes tearing up. And I ad-lib a lot of what I do, so, sometimes we’d be almost at the end of a segment and then my eyes would tear up so badly that we’d have to start over again. So it was when it got to that point, like after six days or something — and the lights are obviously very bright in the studio, and I was so light-sensitive that I just couldn’t do it anymore. Bell: The decision to take him off air was … not difficult. We were unable to mitigate it in any way through glasses, lighting, or camera angles, and I think Bob could not have been a better soldier about it. He was willing to try or do anything to try to continue, but he needed to be reading copy, and pronouncing difficult names of foreign athletes — reading is a pretty important component. And also, you don’t want to make the audience feel queasy about how there’s a guy in their living rooms with a case of double pink eye. Costas: It was my decision, by the way, in the first place. I told them the last night I was on the air before I took the week off, I said, you better get somebody up in the bullpen. Because I can’t keep going this way. On February 12, during a phone call to Today, Costas explained that one night was not enough — Lauer would have to cover for him again. The same was true for the 13th, and then on February 14, Meredith Vieira was called in to take over for Lauer. The decision was historic: She would be the first woman ever to host prime-time Olympics coverage on her own. Meredith Vieira: The next thing I know I got a call from Jim [Bell]. Matt Lauer had already been filling in for Bob, and Jim called and said he wanted me to do a couple days. My reaction at first was sure, and then it was: I don’t know if I can do that. I’m not Bob Costas, he’s a walking encyclopedia of all things Olympics. And that was not me. I can barely walk straight and chew gum at the same time, so I was a little bit panicked. I didn’t really even know the thing about how I would be the first woman ever to anchor the Olympics nightly coverage, none of that was in my head. It was just: I don’t want to make a fool of myself. But Jim assured me that the best producers work on that show, and they do — the sports producers are phenomenal, and they would walk me through any of the technical material. And the rest really was just, I was meeting athletes who had just won a medal, and they’re excited, and you’re playing off of their energy. Because the Olympics, yes, it’s about sports, but it’s also about just the human response to something so magical in their lives. So it had less to do about sports and more to do about them, and their energy, and their achievements. And that just takes somebody to listen. And once that was explained to me I felt much more comfortable, and I knew I was in really good hands. Costas: That week off was spent in a darkened hotel room with various compresses that were dipped in whatever elixirs they put on it to make it feel a little bit better. And they rigged the hotel room so I could at least listen to the Olympics, if not watch, because my eyesight was so bleary. I remember saying at one point that I opened the curtains and looked out the window and I think I saw the Black Sea, but I’m not sure — it could have been the Hudson River, because I was just so bleary-eyed. Matt and Meredith had filled in, and when it got to where it felt like I could do the job again, I told them a day before, “I think I can come back.” So I made the decision about when to stop, and about when to come back. At that point it wasn’t as bad, but it remained noticeable, and it really was a bit of an issue even three or four weeks after the Olympics were over, but it got better with each passing day. I found it odd that some people thought, “Well, he just can’t bear to give up his seat at the Olympics.” I’d done ten Olympics by that time. My honest feeling was: this is my job, and I’m the one who’s prepared to do this job. You know, it’s hard to just — when Matt and Meredith were thrown into it, the researchers wrote stuff for them, and they did a great, professional job. But I’d prepared to do the job; I was the person suited to do the job. And you don’t want to let your colleagues down. They work harder than the hosts do. They’ve spent a year, or a year and a half, traveling the world, doing research, compiling all these research manuals, producing these pieces, and you’re kind of carrying the ball for them. So you don’t want to feel as if you’ve let them down. Vieira: In preparing for it I was I was anxious, because I was worried it would become very technical and I wasn’t up to speed the way somebody like Costas would be. But I had great producers who helped. The irony was a lot of people said to me later, “Did it hit you that you were the first woman?” And I’m glad that wasn’t made a big deal at the time, or I just missed it, because that probably would have made me more nervous. But I wasn’t thinking about that. My memory is that that hit me after the fact. Being the first woman, most of the comments I got — and I think this tells you everything you need to know — the first night I had on a white dress and I got so many comments, “Oh, in the white dress, she looks like an angel.” And you know they would have never talked about Bob Costas’s outfit. Vieira: I didn’t have anchor-type clothes, because I was reporting there, and the next day I had on what I thought was a perfectly appropriate orange sweater. So many comments. “Who does she think she’s supporting, the Netherlands?” Supporting the Netherlands? What are you talking about?! I have on an orange sweater! It was like it was the most anti-USA thing you could do. So I’m the first woman, and what do they talk about? My clothes. Meredith Vieira great job hosting but where did you get the ugly clothes? Really awful! Kinda surprised that Meredith Vieira's color block sweater didn't make headlines for ugliness. On Monday, February 17, Bob Costas returned to work. Vieira: I remember the [negative reaction on social media] toward Bob. People were repulsed with the idea that he would be on camera with his infected eyes. But he’s a consummate pro. He wasn’t going to leave until it became untenable. But there was that reaction, and I remember there were a lot of jokes around it — what do you call it, memes, or whatever? There was a lot of that stuff around the whole thing, and I think Bob would be the first one to laugh about that — after the fact. Costas: Social media is sometimes funny, and sometimes insightful, but a lot of times it’s just snarky. And, you know, I didn’t pay too much attention to it, but from what I could glean, on social media it was like, let’s make fun of him. But in the real world, everywhere I went, strangers, people on the street, people in restaurants were asking, “How are you feeling?” or they would be kind and say, you know, “You were so professional about it,” “You did the best you could under difficult circumstances.” If anyone remembers anything from it, I’d like it to be that. I don’t deserve a purple heart, it wasn’t heroic, but it was professional. You know? I was just trying to be a professional. And if there had been a way that it wasn’t literally written all over my face, you know, if I just felt awful, no one ever would have known anything about it, because that’s what you do. You go to work, especially when it’s something important, and you just do the best you can. But in this case it couldn’t be disguised. And then of course various theories sprung up as to how I got it, and I could say, 1,000 percent, that not only were none of them accurate, but all of them were impossible, so. Bell: I wasn’t shocked by the reaction to it. I think, you know, pardon the pun, but, things are going to go viral out there. And it’s the Olympics, it’s a high-profile event. Bob is arguably the best-known sportscaster of the modern era, and there was all this buildup heading to Sochi, and Russia, and the winter Olympics. And then there was this clearly visible issue happening on your screen. So in a way, the stars lined up for the perfect social-media firestorm. Costas: Now and then, people sometimes, when they just want a conversation, or an icebreaker, when they see you in an airport or something, they might say something that’s … less than perfect. Two or three times I’ve had people say to me: “Do you remember that time when you had pink eye at the Olympics?” And my answer is, “…No! I’ve forgotten. What was it that happened? Did something happen?” [Laughs.] The other part is the idea that — counting the late-night role that I had in Seoul in 1988, I did a dozen Olympics. And I’d like to think that my colleagues and I did a number of very worthwhile things. But I know that because this was so front and center, it’s probably the thing that people are going to remember the most. No one’s going to sit down and review hundreds of hours of tapes and go, “You know, that was really a good thing he did with Michael Phelps.” Or, “That was really a good thing with Carl Lewis, or Jackie Joyner-Kersee.” You know, that doesn’t fit in a tweet. I get it. I get it, and I accept it.